The week my brother's family was in town, my mom kept all of the kids busy with lots of fun crafts. 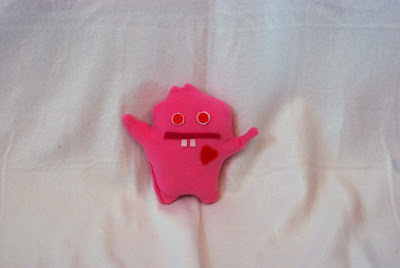 My favorite craft was homemade "Ugly Dolls". 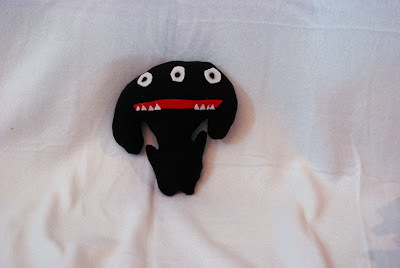 When we went to Disneyland one of the things we gave them on the drive was an Ugly Doll. 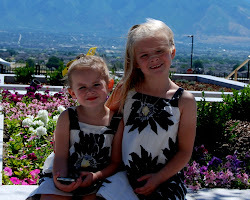 Mom and I thought that they would be very fun to make on our own. I had thought about doing them as Christmas gifts, but time ran out. So, mom got all of the stuffing and felt to create them after the grand kids sleep over. 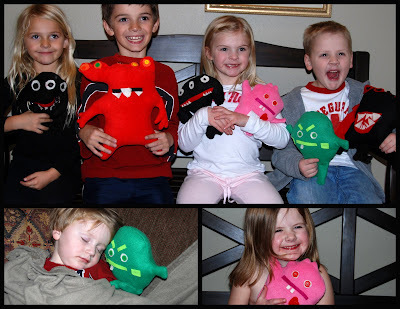 They started out by making patterns and then each cut out their own ugly dolls. Then they glued and decorated their dolls. Mom and I sewed them together and the kids stuffed them. One of the things that Jade did, that I think is absolutely sweet as could be, was put a heart on the inside of her doll. 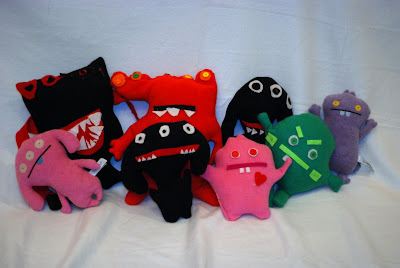 Here are the girls with their adorable Ugly Dolls. Jade and Luke are both holding their younger sibling's dolls. Ivy originally didn't want to be part of the picture and Harrison was asleep. Here they are... I bet you can guess which ones were bought and which ones were made. I have to say that they are all pretty darn fun. Below are Jade and Ivy's dolls. Ivy's is the pink one with the heart on the outside and Jade's is the black one with the heart on the inside. This was a great activity and one that I think we should do again.